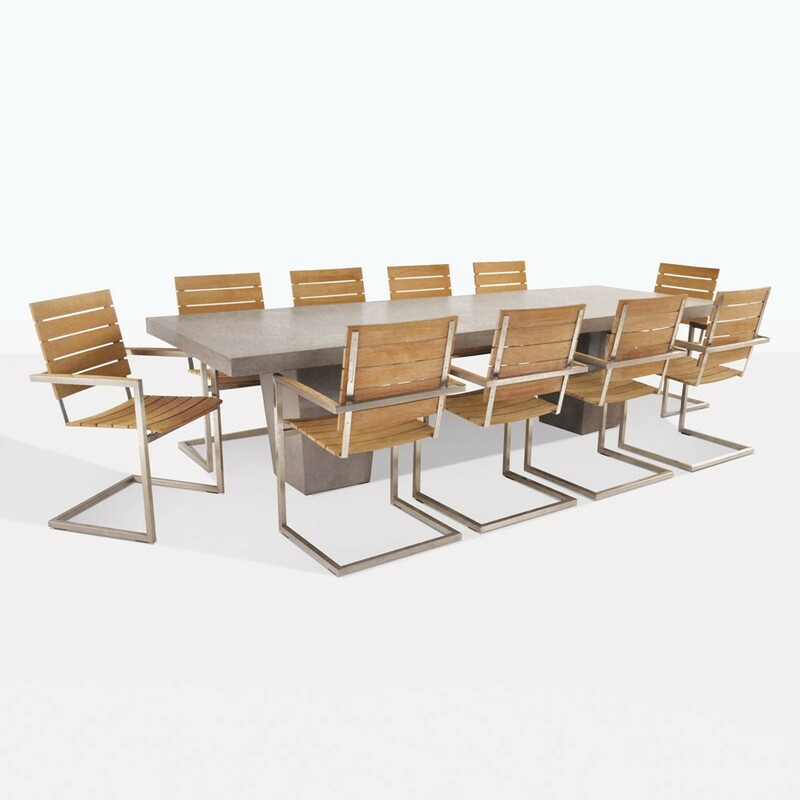 A superb dining setting with a brilliantly modern edge; the 117″ Tapered Leg Concrete Table and Chairs will be a wonderful addition to your outdoor area! Mix and match raw concrete, teak and stainless steel for a contemporary dining set that works well indoors or out. As shown includes the 117″ Raw Concrete Tapered leg table is paired with 10 of our ever popular Bruno Teak Dining Chairs. 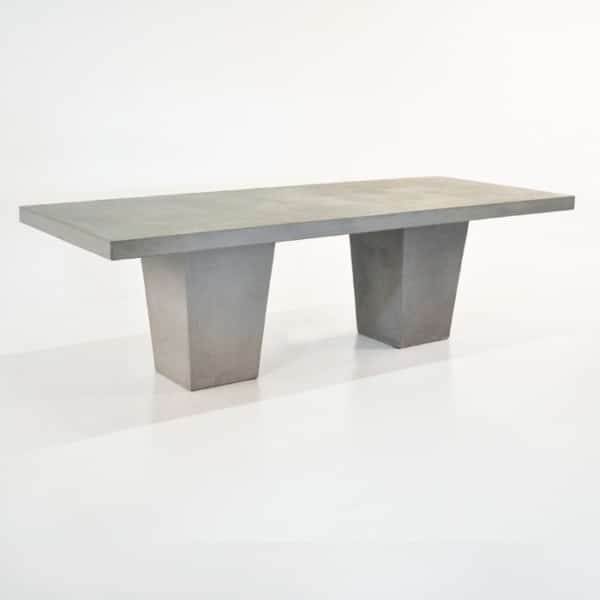 Alluring, dramatic and impressive; the Tapered Raw Concrete Dining Table is often a first choice for our customers who like stable products that are contemporary in style! The Tapered Raw Concrete Dining Table suits both modern and traditional spaces because of its grand presence; a solid table top with thick tapered legs which add a geometric element and aid to bringing this seemingly simple table into the 21st century! 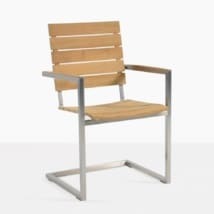 The Bruno Teak Dining Chairs feature a fabulous cutting edge design within the sleigh style legs made of shimmering stainless steel contrasting sublimely with the fabulous slats of A-Grade Teak running across the seat and back each piece. 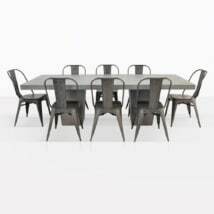 This collaboration of chairs and table looks amazing in a minimalistic courtyard, letting the furniture be the center piece and an amazing area to host company for long relaxed meals. 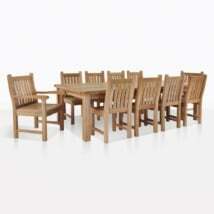 Alternatively, place this setting in an abundant garden for an incredible comparison. Our raw concrete tables are made up of composite concrete, which makes it less heavy than conventional concrete. 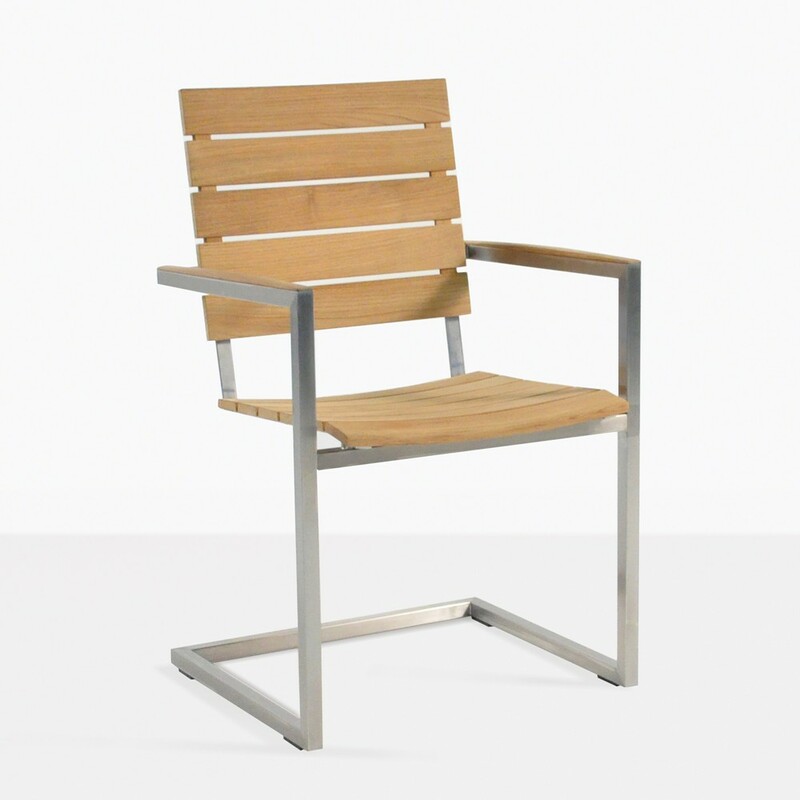 Our Bruno Teak Chairs are made of Marine Grade #316 Stainless Steel and stunning A-Grade Teak. All marine worthy, easy to care for and beautiful products! 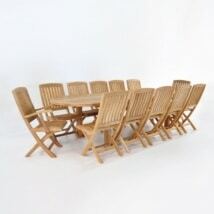 This set is such an interesting and glamorous combination for dining outdoors! 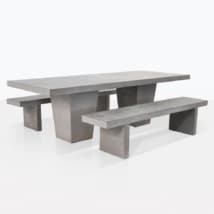 The Tapered Raw Concrete Dining Table is available in 3 different sizes so you may upgrade to fit for your space. Our Bruno Chairs also come in a Batyline® mesh variety. Use our search engine to find a look that suits you. 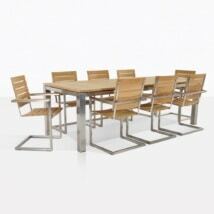 Each item is sold separately.